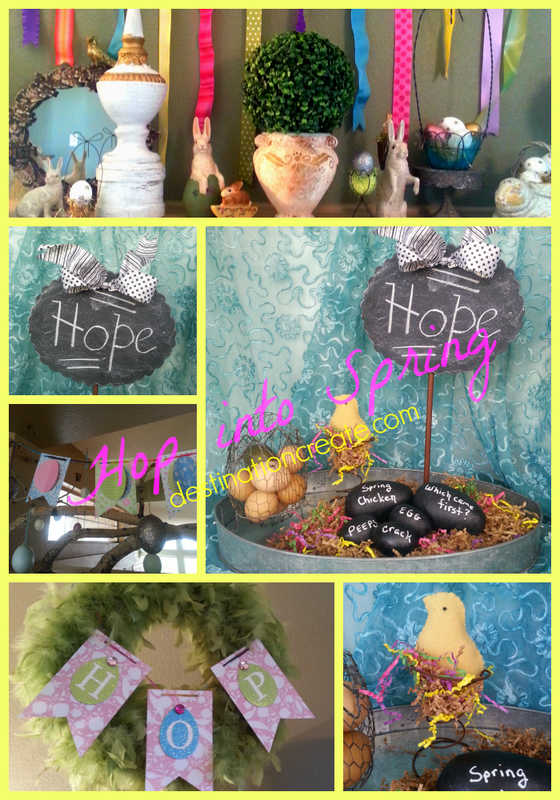 Hop Into Spring with a Cheery Easter Mantel! 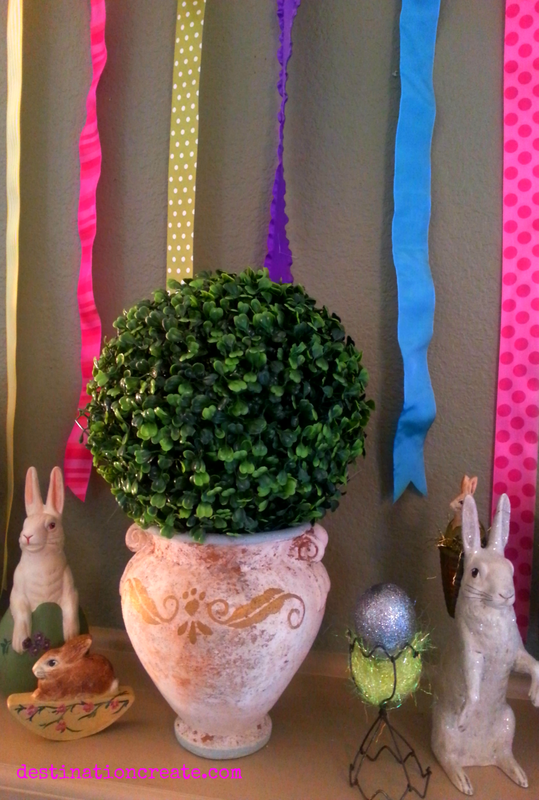 Hop into Spring with a cheery mantel featuring topiary balls, paper garland and embossed eggs. I know, I know… Easter is almost here, but my Easter/Spring decor will stay up until Memorial Day probably! I gathered some of my favorite Easter chalk ware figurines, a paper garland that I made last year and some of my favorite cache pots that I’ve had for many years to create this year’s Spring Mantel. The ribbon garland makes a colorful background don’t you think? 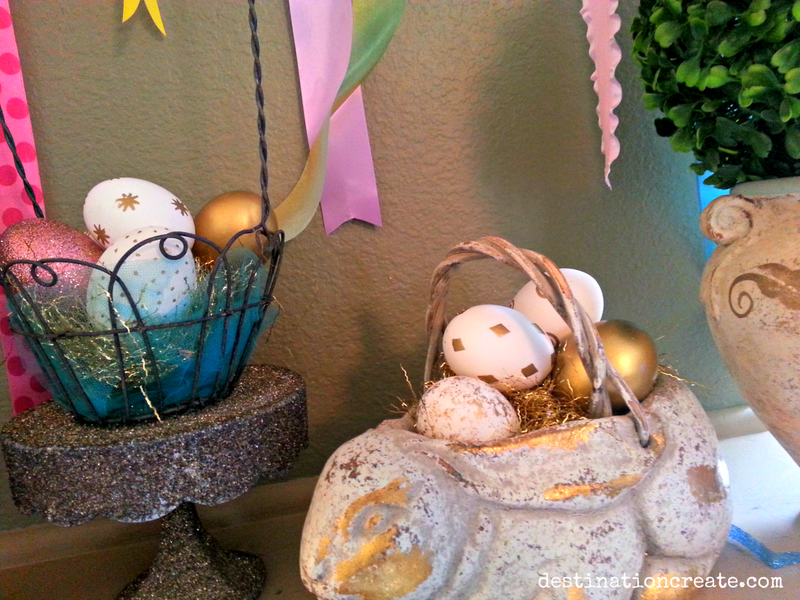 After I arranged my Easter Mantel vignettes, the wall above the fireplace looked so blank! I had just taken down the red & white paper fans that I had up for Valentine’s Day, so the wall really needed more color for my taste. 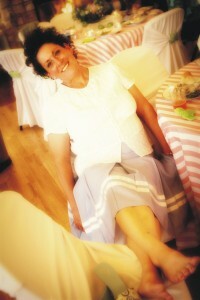 My solution was to grab from my ribbon stash. I simply swagged a piece of tinsel cord across the wall with push pins inserted into the ceiling (sometimes popcorn ceilings are a blessing!) Then I tied varied lengths of ribbon to the tinsel cord. The Spring Egg Banner was one of last year’s projects. I cut the flag shapes from a thrift store book and glued them to cardstock with spray adhesive. The glittered egg letters came from Walmart if you can believe it! They are Easter basket charms. This banner was the perfect project to use some vintage buttons that I’ve been “hoarding”. The buttons are glued to the top of the eggs. This year Walmart just had bright Spring colored glittered letters, no fun egg shape. Check next year to see what they come up with, but shop early or the selection of letters will be dismal! The boxwood balls are temporary until my wheat grass grows. My plan was to put wheat grass in the terra-cotta cache pots. I did plant the wheat and then remembered I had these faux boxwood balls from a brunch I designed a while ago. The balls are the perfect size to top the pots while I wait for the grass to grow. Actually the grass is ready but I think I like the boxwood better. Soak the wheat kernels overnight before planting to give them a head start. Cover lightly with potting soil. Here’s a close-up of the mantel. See the gold embellished eggs? I made these many years ago and I still absolutely LOVE them! I like to think I’m the first person to use mini rubber stamps and gold embossing powder on an egg- probably not, but fun to think it. Some of the eggs are plain bisque eggs from Hobby Lobby and some are eggs that I blew out. Notice the gold embossed eggs. Store these fragile blown eggs in the original egg carton. Mine have been safely stored for 15 years. 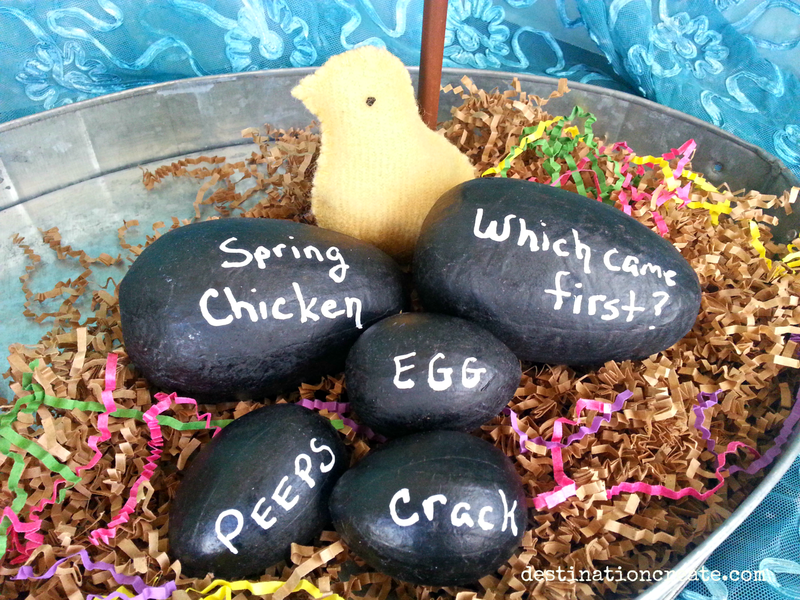 I made these “chalkboard” eggs last year but used them in a different vignette this year. 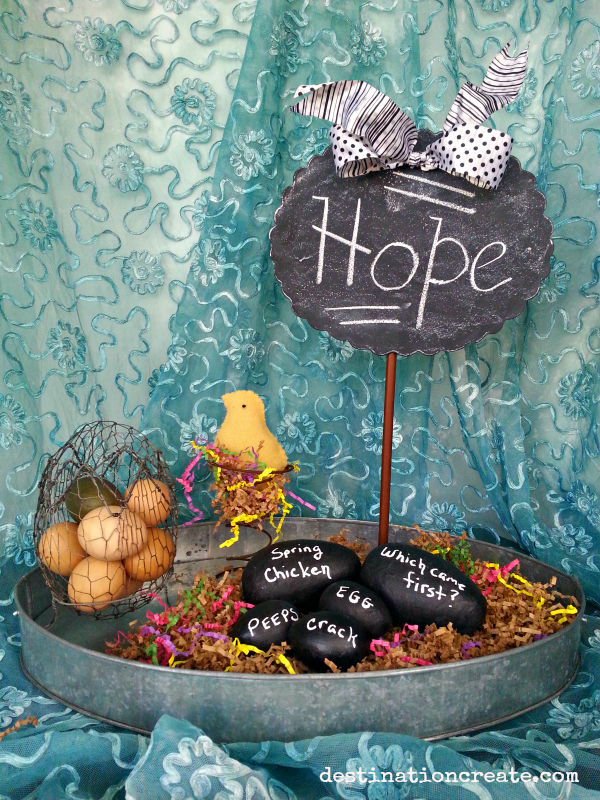 Just paint paper mache eggs with black paint and use a white chalk marker to write the words. I think my favorite part of this Spring display is the felt baby chick propped in a rusty bed spring- it just makes me smile! The galvanized tray is a thrift store find and paper shreds are one of my “go-to” products to finish off a design. One last idea…Peeps on a stick. Last year I had wanted to make my own chocolate covered marshmallow bunnies but LIFE got in the way and I ran out of time. Soooo… I just dipped Peeps in chocolate. Delicious! Easy! So much better than the cheap bunnies at the grocery store. The crunchy sugar under the chocolate was a yummy bonus. This year I MADE time to dip these adorable Peeps bunnies. 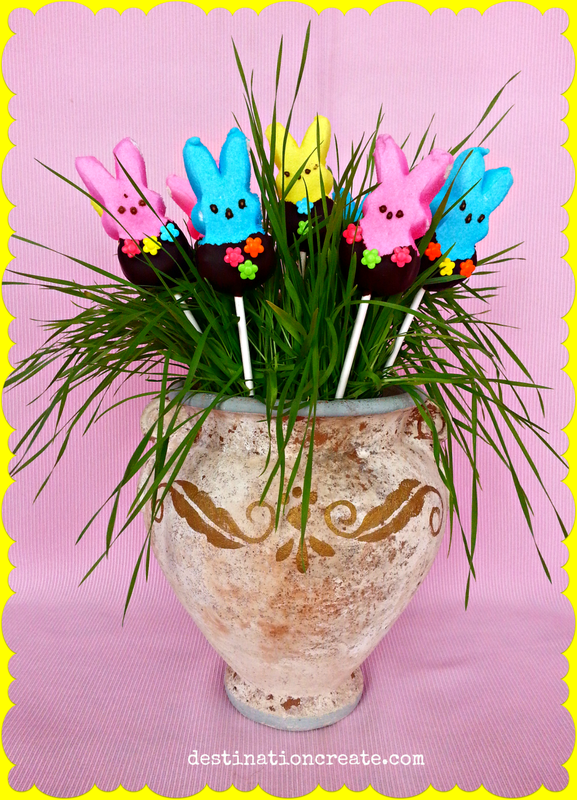 They have a little less chocolate than last year’s version, which my husband likes, and a group of them “planted” in wheat grass makes a delightful centerpiece. Aha! There’s that wheat grass I said I planted- found a use for it. Peeps bunnies on a stick… don’t you just want to bite their ears off? I hope this little post gives you a few inspiring ideas for a fresh Spring Mantel this year or maybe next year!